In this week’s issue of Woman…. 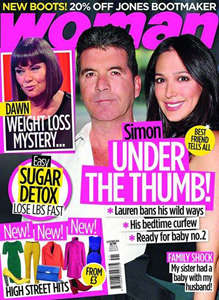 In this week’s issue of Woman, find out why Simon is under the thumb, read about Dawn’s weight loss secret and try the easy low sugar diet that will help you help you slim down AND improve your health. All this, plus fun foodie ideas, instant updates for your home and fabulous travel ideas for the winter months – out NOW!